Georgia, USA, celebrated its first Plastic Pollution Awareness Day on Feb. 15, 2017, in the state's capital of Atlanta. The initiative was spearheaded by a 14-year-old named Hannah Testa, founder of Hannah4Change and a youth ambassador for Plastic Pollution Coalition. 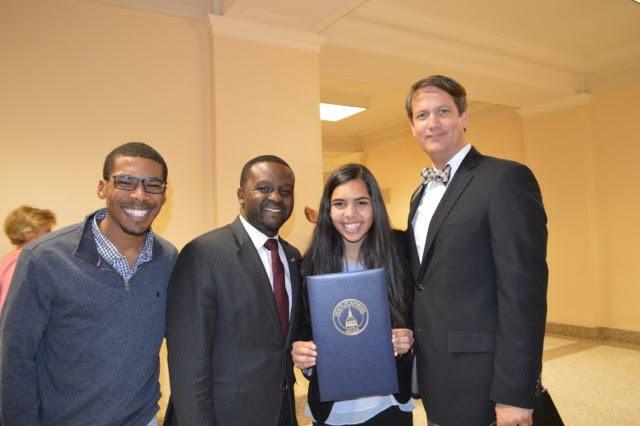 An environmentalist since age 10, Testa partnered with Georgia Senator Michael Williams to create Plastic Pollution Awareness Day. Testa created an exhibit that teaches people about plastic pollution, and the exhibit was displayed in the state capital building. More than 75 groups and organizations supported Plastic Pollution Awareness Day and many were in attendance. In addition to Testa, speakers at the event included Charles Orgbon III, CEO of Greening Forward; John R. Seydel, Director of Sustainability for the city of Atlanta; Ron Slotin, a former State Senator and current congressional candidate; and Jane Patton, Managing Director of Plastic Pollution Coalition. Orgbon commended Testa for her activism around plastic pollution and said single-use plastic can be a "gateway" for others into environmentalism. "Bringing reusable bags and water bottles is a great start," he said. Seydel encouraged attendees to make others aware of plastic pollution through conversations and even cleanup. "Every time we eat with my grandfather at Ted's, we take a walk downtown," he said. "We pick up bottles and bags. At 78, my grandfather still picks up trash, and everyone says 'Is that Ted Turner picking up trash?'" Use different approaches to bring awareness to the problem, continued Seydel. "If they care about their health, you could tell them about microplastics in fish... Or get restaurant owners on board by talking about how much money they could save by serving straws upon request." Reducing and eliminating single-use plastic is core to PPC's mission, said Patton, who commended Testa's initiatives. "I want to honor Hannah and the work that has been done to raise awareness and organize young people in the city of Atlanta," she said. "That work starts with the individual but is very powerful at the community level." Hannah Testa has inspired youth in Atlanta and around the world to take action against plastic pollution. Laura Turner Seydel, Chairperson of the Captain Planet Foundation signs Hannah's traveling quilt (#quiltagainstplastic) on Plastic Pollution Awareness Day in Atlanta. For his part, former State Senator Ron Slotin said the public supports plastic pollution reduction, and added, "We need to make sure local communities have the right to ban plastic bags." Testa spoke to the urgency of the plastic pollution problem. "Most people are unaware about the effects of plastic pollution. 300 million tons of plastic is produced globally per year. Researchers say that by 2050, there could be more plastic in the ocean than fish. If we don't act now, we might be leaving the next generation with a problem too big to solve. Let's work together to leave this great state in better shape for future generations by tackling this issue of plastic pollution. We can change the world. We will change the world."